Thanda Safari Private Game Reserve on the Elephant Coast in KwaZulu-Natal, South Africa, strives to transcend the expected luxury of a 5-star game reserve and lodge. Thanda Safari Private Game Reserve in South Africa has been synonymous with setting standards and is recognised as a leader in luxury accommodation. The Zulu word for 'love', Thanda Safari embraces the philosophy of 'for the love of nature, wildlife and dear ones' in every aspect. This private game reserve in KwaZulu-Natal, South Africa, provides a big game experience with sought after Elephant, Lion, Buffalo, Rhino and Leopard amongst the very entertaining Wild Dog, Cheetah, Hyena, Warthog and plains game as well as an abundance of bird life. The balmy year round climate of the Elephant Coast and the wealth of local attractions including diving and snorkelling, create a utopian South African holiday destination. Guests on safari can expect exceptional service and facilities. The main building of this exclusive safari lodge offers a 5-star Wellness Centre and luxurious guest areas including a library and cigar bar, business centre and exclusive wine cellar. Activities include morning and evening game drives, walking safaris and sumptuous bush meals as well as an impressive list of spectacular local tours, excursions and recreational opportunities. 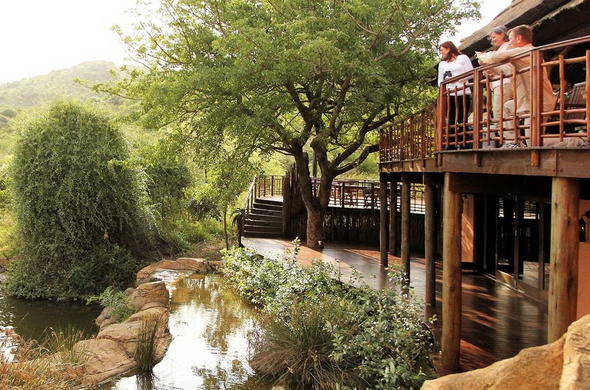 Thanda Safari is the ideal destination for a romantic getaway or honeymoon in South Africa. Ask your Siyabona Africa consultant about Romance Packages at Thanda Safari Game Reserve. Thanda Safari Private Game Reserve in KwaZulu-Natal offers amazing game-viewing possibilities during a Big Five safari in South Africa. Enjoy a meeting with the Zulu people and their culture. Be witness of a typical cultural dance at this KwaZulu-Natal game reserve.